Why Were There So Many Tornadoes During Hurricane Irma? Meteorologist Steve MacLaughlin explains the influx of tornadoes that came to South Florida during Hurricane Irma. As Irma made its landfall in the Florida Keys last weekend, South Florida experienced the “big three” effects of a hurricane: damaging winds, torrential rains, devastating storm surge. We also had the fourth and sometimes less-common effect: tornadoes. A total of 16 tornado warnings were issued for South Florida on Saturday and Sunday. This does not count any that were issued for Southwest Florida when the storm made its second landfall around Naples. Also, this doesn’t count any warnings for Central & Northern Florida as the storm continued moving north late Sunday. Nine of the 16 warnings were issued within a three-hour-period of time Saturday evening, at a time when Irma was hours away from landfall. Damage assessment teams from the National Weather Service will be surveying areas in the southeast and southwest coasts of Florida, looking for evidence of tornadoes along with storm surge data. Within Miami-Dade and Broward Counties, there are three areas of interest based on tornado reports. The first tornado was reported Saturday at 6:38 p.m. It was located one mile southeast of Wilton Manors in Oakland Park. Less than an hour later, another tornado was reported near Homestead Motor Speedway at 7:20 p.m. Warnings continued that evening, but the next report did not occur until Sunday at 2 p.m. when a trained spotter detected a tornado on the ground near Fort Lauderdale/Hollywood International Airport and I-595. All three of these tornadoes were visible on First Alert Doppler 6000, but the one that was easiest to see before it happened was the one near the airport. Our exclusive radar saw a tornadic signature coming in to the area before the warning was issued and before the tornado was reported. Are tornadoes rare in South Florida? Absolutely yes. 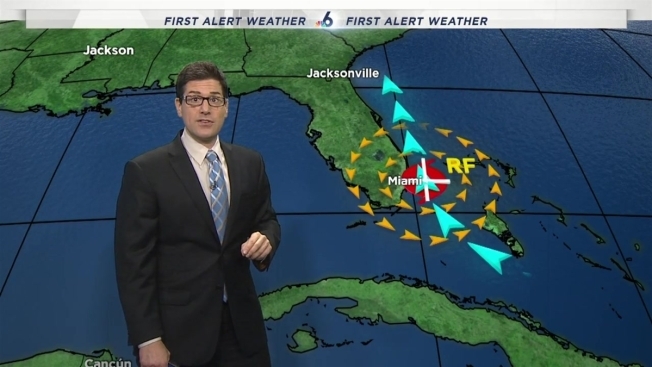 Are tornadoes in hurricanes rare in South Florida? Not as much so. Tornadoes are very common when hurricanes approach landfall, but what is rare is for so many to pop up during one storm and so many in such a short period of time. So, why did they happen? Irma’s track was the key. As we talked about it in the days leading up to the storm, tornadoes have four quadrants: Right-front, right-rear, left-front, left-rear. If Irma had tracked up the east coast of Florida, Miami and Fort Lauderdale would never have gotten onto the right side of the storm, the side we call the “dirty side.” We would have stayed on the left side of the storm the entire time. We would have felt hurricane conditions, but much less so and for a shorter period of time. Because the storm tracked west, we were on the eastern or right side of the storm, which is also known as the dirty side. More specifically, we were in the “right-front” quadrant as the storm approached even after it made both Florida landfalls. This quadrant has the worst weather; the strongest winds, the heaviest rain, the on-shore flow that causes storm surge and tornadoes. Why? The winds are pushing on-shore as the storm is also moving forward. Add both of these winds together and you get the worst weather. Why was Tampa spared the worst of Irma? The storm passed just to the east which means Tampa never entered Irma’s dirty side. As bad as Key West was hit, landfall was 20 miles east of the island. Had the storm been 20 miles west, it would have been tremendously worse. And why did Jacksonville and Charleston get some of their worst flooding ever? Those cities were hit by that same dirty side that hit the southern east coast.